↑ 1.0 1.1 Cumpston, Mike (2003-01-16). 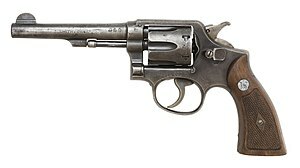 "The First M&P". Gunblast.com. 喺2008-05-02搵到. ↑ Ayoob, Massad. Small handgun attitude. Guns Magazine, May 2003.